I recently had the opportunity to start reviewing products for the amazing Fairhaven Health. Being a registered nurse having worked in Labor and Delivery for 12 years and a breastfeeding mom, I love this company. Their mission is to “develop products designed to safely and naturally promote fertility, pregnancy wellness, and breastfeeding success.” They offer a wide variety of fertility, pregnancy and nursing products for women. The products are based on the research of medical experts and they combine Western (allopathic) medicine with clinically-supported research in herbal/homeopathic fields. 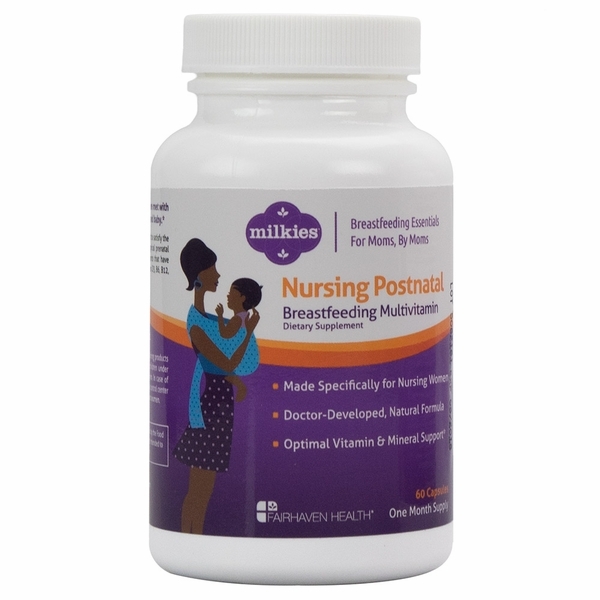 This past month I started taking the Milkies Nursing Postnatal Breastfeeding Multivitamin. This unique multivitamin is optimal for the breastfeeding mom because it contains the specific nutrients needed by lactating women to help keep both themselves and their babies healthy. One of the reasons I specifically like this blend is because it contains 700% or 2800 IUs of Vitamin D3. There has been a lot of buzz about D3 and its significance treating and preventing a “wide array of conditions, including high blood pressure, osteoporosis, depression, obesity, seasonal affective disorder, prostate cancer, lung cancer, breast cancer, diabetes, rickets, irritable bowel syndrome, multiple sclerosis, and rheumatoid arthritis.” (Source) It’s also a well known fact that many infants who are exclusively breastfed are at high risk for Vitamin D deficiency. I always felt it was strange that vitamin D was prescribed for my children. Certainly, nature’s perfect food couldn’t be missing something, could it? Could it be instead that many mothers are vitamin D deficient and therefore the baby is not getting enough of this vitamin? I am often discouraged at how we treat the symptoms of a problem, but not the underlying cause in today’s medical practice. In testing this product, I was delighted to find out that research has been done to prove mother’s taking supplemental vitamin can pass it on to their infants in high enough doses so their babies will not be vitamin D deficient! The vitamin D supplement coupled with the other vitamins and minerals of Milkies Nursing Postnatal Breastfeeding Multivitamins has made it my vitamin of choice. As a busy mom, I know it can be hard to always eat the healthiest diet, especially when you are sleep deprived from late night nursings! Milkies Postnatal Breastfeeding Multivitamins can help ensure both yours and your babies’ health during this joyous time of motherhood. Breastfeeding is a tough job. As a former International Board Certified Lactation Consultant, I have always knew the importance and supported breastfeeding as much as possible. As a mom, I’ve had the joy of nursing all 4 of my children and still have a little one that I can share this special bond with. I’ve found that one thing that can make your experience more enjoyable as a breastfeeding mom is to have great breastfeeding products. Today I’m delighted to share a Milkies Softies Nursing Pads from Fairhaven Health. I love Fairhaven Health because they provide safe and natural products to help you from preconception through pregnancy and nursing. Having good nursing pads is key. I can share from personal experience – there is nothing worse than going to work and realizing mid-shift your shirt is soaked with milk! While I always liked the idea of earth friendly reusable pads, I have been using disposable since they seemed to prevent wet shirt incidences a bit better. I am delighted to report that Milkies Softies Nursing Pads are my new BFF! Not only are they soft, reusable and earth friendly, but they hold a lot of milk! I did a little test in my kitchen and each pad held up to 7 teaspoons of liquid. They moisture was quickly pulled from the part of pad touching your skin to leak resistant outer layer, helping prevent discomfort and chafing. Even though I continued to pour water on the pad to the point it couldn’t hold any more liquid, it never came through the outer layer. Another great reason to love Milkies Softies Nursing Pads is they are super easy to care for. Just toss them in the washer and dryer or hand wash. Very reasonable priced at just under $5.00 per pair, these will save you money instead of having to purchase disposable pads. Avoid the embarrassment of “milk shirt” and try Milkies Softies Nursing Pads from Fairhaven Health today! Disclaimer: I received Milkies Softies Nursing Pads from Fairhaven Health to facilitate my review. FREE Online Catholic Conference 4 Moms! My biggest (and favorite) volunteer effort each year is co-chairing the Columbus Catholic Women’s Conference at the Ohio Expo Center. It’s coming up this February 21st if you’d like to join us!!! The conference is one of my favorite days of the year, but the only bad thing about running a conference is that I don’t get to enjoy it! So I was very glad to see this great free, online Catholic Conference 4 Moms! The conference will be March 6-9. Registration is going on now. Go to www.CatholicConference4Moms.com for more info. I know, I’ve been MIA for quite some time. I’ve had this post drafted for some time now but just haven’t had the time to finish it up! After reviewing my 2014 stats I figured I owed you all something new. I also know there are probably lots of you out there who have been on and off the wagon with THM so I wanted to share my story so people know you can start over after time off plan and still be successful. My story in a nutshell – I started THM in May of 2013. Although I didn’t think I needed it because was already exercising 3-4 times a week and a healthy weight, my friends were raving about it so I thought I’d give it a try. I am so glad I did – it was the best thing that I have done for myself health-wise! By September I had lost an additional 10 lbs and was thinner than I had been since high school. I also felt energized and was eating all healthy and delicious meals. 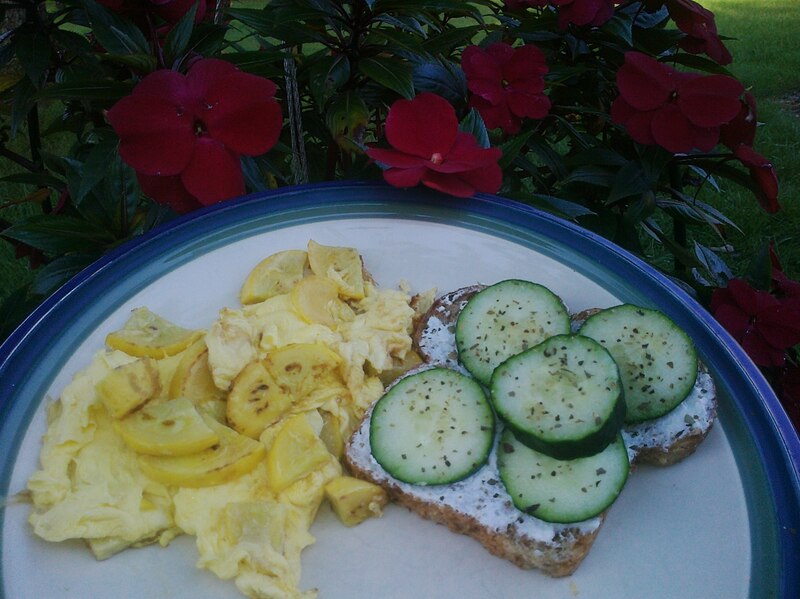 Summer 2013 – on plan – truly trim & healthy! In October, I was expecting baby #4 and it all went downhill. It was my intention to stick to the plan and gain only 20 lbs, but I felt so tired and awful the whole pregnancy and fell into old junky eating habits. I gained 40 lbs. Three months postpartum I got back into THM. Although its been a slow ride, I’ve got just 10 more pounds to be back where I started! It’s my hope to be at goal weight by summer. Moving on…..While I love trying new recipes, there is nothing worse then spending a lot of time, energy and money and having a flop. With New Year’s Day here, I’d like to share some recipes I have tried this year that have been huge hits in my house. I hope this saves you some time and you enjoy them! Another great crockpot recipe is this Shredded Chicken recipe from RhondaSue.com. It’s a great base and can be used as an FP, S or E.
Another favorite was http://www.alldayidreamaboutfood.com’s Twice Baked Spaghetti Squash (S) I added diced chicken to it and made it a complete meal. If you haven’t visited that site yet, I highly recommend it. Every single recipe I tried was amazing and she’s recently added THM sweet blend substitutions. This last dinner recipe is a bit involved, but worth the effort. If you like pork, try Smothered Pork Chops form wellnessmama.com. Even though my kids know it is a “healthy recipe”, they request it all the time! Below I’ve included the links for some uber delicious and healthy drinks and desserts….. If you are going to try just one, make it the peanut butter fudge brownies!!! Again a bit involved, but worth your time! A few years ago I joined a book club. We have one rule, we only read fiction. These days, most of my reading is non-fiction, but I really enjoy a little “getaway” in a great story. Since all of us in the group are Catholic and seem to enjoy the same type of books, we have selected several “Catholic Fiction” reads in the past. Last summer we especially enjoyed two books by Ignatius Press – Do No Harm by by Fiorella de Maria (read a review by fellow blogger and book clubber Sarah Reinhard here) and The Spear by Louis de Wohl (read a chapter here on the Ignatius Press website). This summer, we started with The Rising by Bob Ovies and what a thriller it is! C. J. Walker seems like a normal 9 year old boy. He attends the local Catholic school, attends church with his mother and likes to kick the soccer ball around. However, after attending a wake with his mother, he discovers he has a gift; the ability to heal the sick and raise the dead. As his power is discovered and made public, his mother Lynn tries everything to protect her son from those who want to exploit this gift, including that of her ex-husband, Joe. C. J. quickly becomes a target for those who are desperately seeking healing, the Government and even members of the Church. Befriended by their pastor, C. J. and his family search for meaning in the gift and how it should (or should not) be used. In the family’s quest to protect C. J. and allow him to live a “normal” life, a great race ensues and redemption is found in the most unlikely person. Ovies does an amazing job of presenting a variety of moral dilemmas for the reader to sort through with multiple characters. From the scientific community looking to breed a “superhuman”, the government looking for a superpower and the Church looking for the largest evangelization movement since Jesus, it gives the reader food for thought. 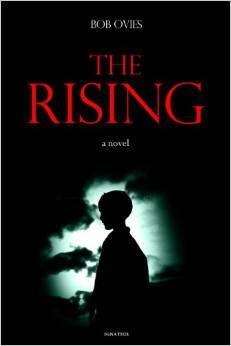 As with the other Ignatius Press novels I’ve read, The Rising is well written and a page turner. I thoroughly enjoyed it and devoured it in less than 24 hours! As an added bonus, Ignatius Press also offers study questions if you are part of a book club (check them out here) or just want to ponder the material a little more deeply. The Rising is available from Ignatius Press. Since my last post “Trim Healthy Mama on a Shoestring” got hundreds of hits, I thought I’d share some more budget saving recipes for you all! After 4 months of THM, I am excited to say that I am under my goal weight and wearing a size 2! I was never this thin, even during high school. I have found that having some “favorite but delicious recipes” really makes sticking to the plan very easy, so I want to share what we’ve been eating with you! I purchase everything at Aldi and Walmart with the exception of protein powder and I prefer KAL Stevia Extract. I titled this piece “Aldi Chef” because I want you to know that you can shop at a low cost store like Aldi and still make gourmet food. In fact, last week, Fr. Leo Patalinghug, author, chef and winner of Bobby Flay’s “Throwdown” came to my birthday dinner. Fr. 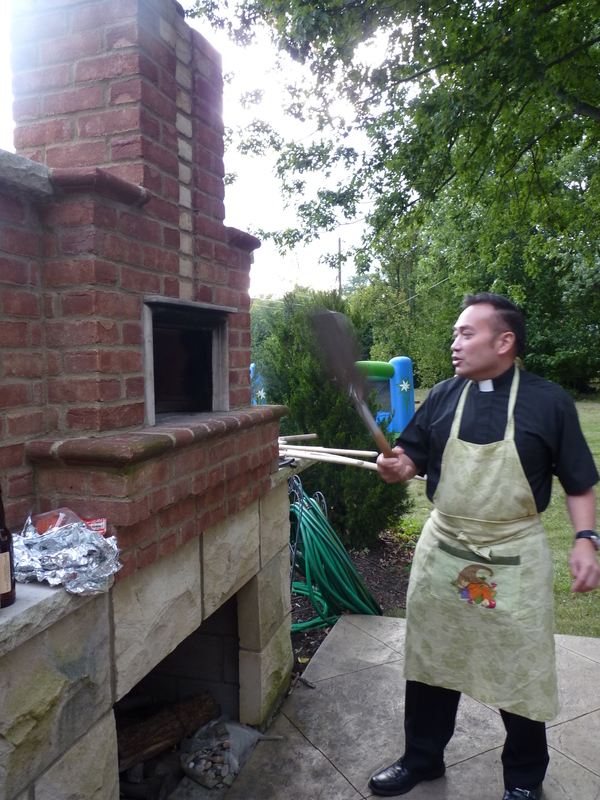 Leo was invited as a guest, but couldn’t help himself, he had to cook in my awesome pizza oven! 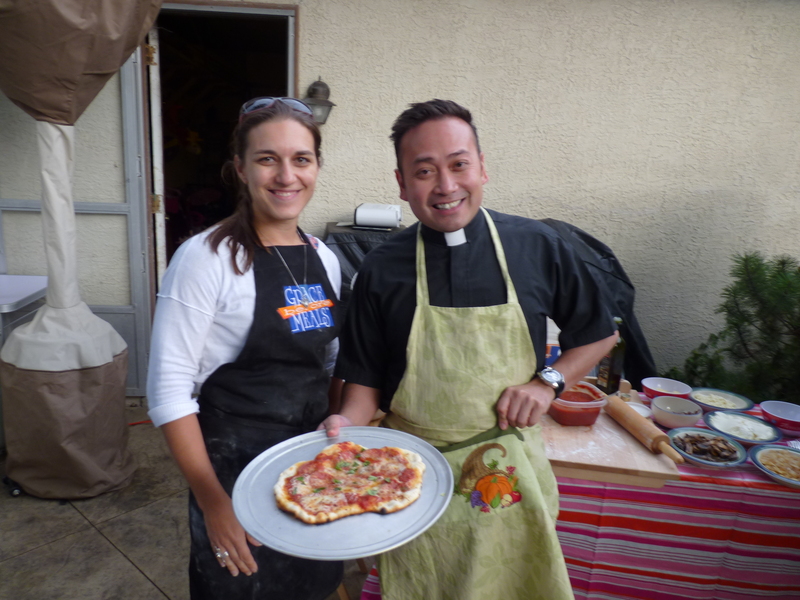 Although he had never even heard of Aldi, he made 26 gourmet pizzas with all the ingredients from aldi except for some sopressata that I got at Marc’s Closeout Store!! But I digress, you want money saving THM recipes!! I am in no way a chef and these are not gourmet, but today I am going to share with you “a few of my favorite things” including links and pages to THM recipes you can get a majority of the ingredients at aldi or walmart. Save money, eat delicious meals and be a “skinny-mini” like my daughter calls me! My second favorite breakfast is egg beaters mixed with sauteed spinach and mushrooms. Since I do a bulk order of Joseph’s Pita’s (see previous post) I serve it up in a pita or lavash wrap. If I use a scant amount of butter, its a FP, but if I use more than a teaspoon and want to butter up my mushrooms, it becomes an S.
Kashi Berry Surprise is another family favorite. There is no real “surprise” to this recipe, except my husband calls it that and the kids think its cool. Mix up some 0% Fat free Greek Yogurt with some stevia, toss in fresh sliced strawberries, blackberries & rasberries and sprinkle on about 1/2 cup Kashi “GoLean Crisp! Toasted Berry Crumble” cereal. Its a great (E) meal. On the weekends we enjoy Trim Healthy Mama Pancakes (E) topped with stevia sweetened 0% Fat Free Yogurt, sliced strawberries and a swirl of fat free whip cream or sugar free syrup. Another family favorite is the Trim Healthy Mama Cottage Toast (p. 319 in Trim Healthy Mama). With fresh tomatoes and cucumbers in abundance this time of year, I eat this for breakfast, lunch, snack and dinner! Protein Packed French Toast is another great way to start off breakfast. I do buy Swanson’s Grass-Fed, Certified rBGH-free chocolate whey protein powder presweetened with Xylitol and Lo Han (a natural herbal sweetener). Turkey, happy farms light spreadable cheese (or laughing cow from Walmart), lettuce & tomato on sprouted bread (E) is a staple. Easy to pack in my kids and husbands lunch as well! We love the Apple Cinnamon Greek Yogurt Swirl (p. 250 THM) Its more like a dessert than lunch! Lavash pizza (S) is a great way to use up all my weekend pizza fixings. I make my own home made pizza sauce and top with mushrooms, peppers, pepperoni, olives and italian blend shredded cheese. Pop it in the oven or microwave to melt the cheese and enjoy the deliciousness (I have to credit my friend Maria for this idea). I also eat a lot of salads. Today I had lettuce with tuna, garbanzo beans, tomatoes & peppers with Wishbone Salad spritzers for an (E) salad. The possibilities for salad are endless! Kashi chewy granola bars (E) It may be a “frankenfood” but great for on the go! Peanut butter cup shake (S) Can you just say YUM!!! Awesomeness in a cup, especially if you need a little sweet treat in the afternoon. The Shrinker – the weight loss drink designed by Serene and Pearl. With little kick from the Cayenne Pepper it makes a delicious and trimming treat! Wasa Sourdough Crisps with Happy Farms Spreadable Cheese (FP for one, E for 2) – So easy, great when you want something really crunchy! Gwen’s Nest Luscious Lemon Greek Yogurt this is a delicious, sweet treat and a FP!!! Rasberry Sorbet – 1/4 cup almond milk, stevia to taste, 1/4 tsp vanilla extract, 1 cup frozen raspberries (or make it a mixed berry blend) Blend in blender (or vitamix if you have one!) You can also use Greek Yogurt instead of almond milk. 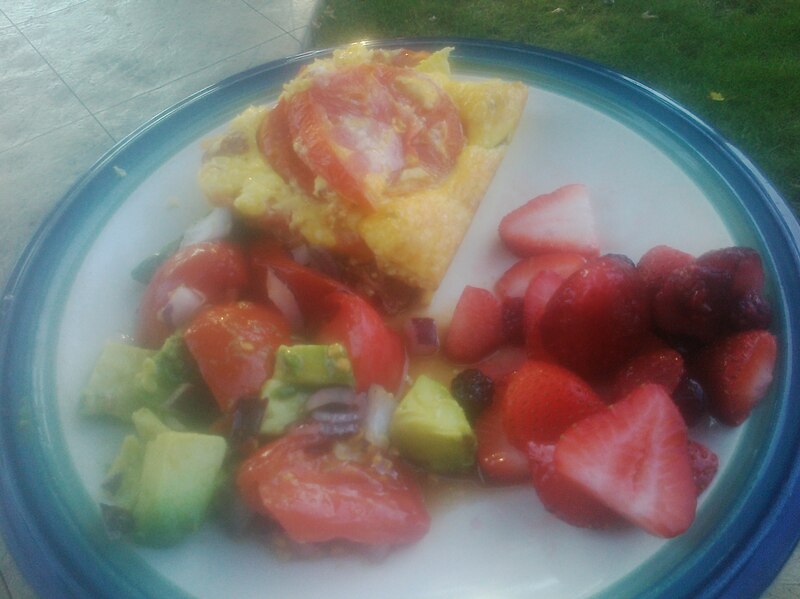 Basic Quiche (S) THM page 319. This crustless quiche is basically a dozen eggs mixed in with your favorite toppings. We like cheese, turkey bacon, spinach, mushrooms, peppers, olives and tomatoes. This week I served it up with this awesome Tomato & Avacado Salad and a mixed berry salad. Gwen’s Nest Cheeseburger Quesadillas (S) – can you just say AWESOME! I always make a huge batch of these so we can have them for lunch the next day. Yum, yum, yum. Dreamfields Pasta and Marinara Sauce. I buy an organic sauce with only one gram of sugar. They carry one seasonally at Aldi, so you have to stock up when they have it. Otherwise you can take fresh tomatoes, puree in the blender with one can of low sugar tomato paste, season with spices and reduce on the stove or in the crock pot for 3-4 hours. Serve it up with your favorite low starchy veggies! I make low carb meatballs to go with the pasta as well to make this an S meal. I know this should be an only “occasional” treat since it uses Splenda, but Breyer’s Low Carb Ice Cream is our favorite!! Top it off with Chocolate Covered Katie’s Peanut Butter Chocolate Shell for an amazing after dinner snack (S). Like a little fruity dessert? Joy on our Journey’s delicious No-Sugar Gluten-Free Apple Crisp (E) is another favorite. Since it uses oatmeal for the “crisp” part, we eat this for breakfast too! If you are a chocoholic like me, you’ll enjoy Cake in a mug (S – THM pg 380). Topped off with a little fat free whip cream, it will satisfy your sweet tooth! My husband loves cheesecake, so we make the THM crustless Basic cheesecake (S, THM pg. 373) or for a slightly different version, try Atkins Crustless Cheesecake and switch out the splenda with stevia. If you are new to THM, I hope this helps you get started with some tasty meals that my family enjoys. If you are a pro, I hope it gives you some new ideas for your meal planning! As much as I love my Trim Healthy Mama lifestyle, I’ve been spending a ton of money on food over the past four months. It seemed like I was always running out of something and I was running to the grocery store every day! Now that I have my fridge and cabinet converted from sugary junk to wholesome foods, I have really been trying to keep the grocery bill down! Here is a few ideas that have helped me to stay on budget. Once a month Wal-Mart trip…. Now I am really trying to only shop once a week and stick on a budget. On the first week of the month I stock up on Joseph’s pitas, lavash, Dreamfields pasta, and low carb tortillas and Breyer’s low ice cream!! I buy as many pitas and lavash breads as they have (usually around 6 of each) and toss them in the freezer. If I run out, I have to figure out something else to use. Extra trips to the store always seem to cause the budget to explode. Be creative with what is in your fridge and freezer! No more weird ingredients…. I try to shop the other weeks only at Aldi and only use what they sell! Really Easy Roast (S) – I’ve made it with beef and venison. Just throw it in the crock pot and season with Montreal Steak Seasoning, pour in one cup of water and top with a sliced onion. Cook for 8 hours on low. It was so tender my kids ate the whole thing!! Tacos (S) – I season low fat ground beef with aldi taco seasoning (3 carbs) and serve in low carb tortillas with lots of veggies. Chicken BLT Wraps (S) – Grilled chicken, bacon, lettuce, & tomatoes in half a Joseph’s Lavash served with caprese salad on the side (fresh mozarella, tomato and basil). Chili (E or Crossover) – I use ground turkey to keep it low fat and season with Aldi taco seasoning (yes, I meant to write taco, we like it better than the chili seasoning) Again it only has 3 carbs. I use one can black bean and one can chili beans with 2 cans diced tomatoes. Grilled Chicken Salad (S) – use up all your garden veggies to make a delicious salad! I top mine with chicken grilled on just a heated pan with Kickin’ Chicken Seasoning from McCormick. Use less than 3 gms chicken and Wishbone spray for a FP! Mediterranean Wrap (S) – I used to eat a lot at Noodles and Company restaurant loved their Mediterranean wrap. This is my own rendition of that recipe: Grilled chicken breast with diced cucumber and tomato topped with feta cheese in a Joseph’s pita. Its great all by itself or tossed with balsamic vinagarette. Ratatouille (FP) – sautee one onion, one green peppers and a few cloves of garlic until softened in scant amount of coconut oil (just enough so they don’t stick to the pan, but not enough to put you in S territory). Add in 1 cup eggplant, one cup zucchini, one cup yellow squash and cook until soft. Add in 2 red tomatoes and 1 yellow tomato and season with basil, parsley, salt and pepper. I wanted an “E” meal, so I served over dreamfields pasta with one homemade sourdough biscuit on the side. You can also add a little grilled chicken on top if you’d like some meat in your meal. Keep it under 3 gms for FP! Make smoothies ahead of time. Fresh smoothies are best, but when I am in a rush in the morning sometimes they don’t get made and I give my kids a cup of Greek Yogurt instead. I’ve been burning through 5 tubs of Greek Yogurt a week and that is really expensive! I found blending up my kefir into smoothies as soon as I strain my kefir and keeping a pitcher ready to drink in the fridge helps make it more accessible. With the warm weather I’m getting a batch of kefir every 12 hours, so making quite a lot and also making kefir cheese. Form a local THM email group – We have formed a local yahoogroup for our THM friends and share our success stories and favorites. It’s like a microcosm of the THM FB page but since we are all close friends already can post more private things. We share recipes, which stores are having sales on THM items, meal plans and other tips. We have also ordered Joseph’s Pitas and Lavash in bulk. They cut you a huge discount when you do this and then we just freeze them to have easy access. Get a THM buddy – I have a wonderful friend here in town that is doing THM with me. Whenever each of us finds something new we really love, we pick up extra for each other and drop it off. It started out with me bringing her a little THM starter kit with Joseph’s pitas, glucommanan, stevia, home made sugar free berry syrup. Since then we’ve swapped many fun things like Sans Sucre Stevia sweetened brownie mix, True Lemon Drink Mixes, Oolong tea, Steaz stevia sweetened drinks, SOBE drinks and even samples of our favorite homemade dishes. It’s fun to try new things, surprise your friend with little treats and look forward to what new things you’ll receive. We also stock up on things we see on sale for each other to save both money and time. So far, the budget (and my husband) have been much happier! What are your favorite THM Money Saving Tips? This post is linked to Gwen’s Nest and Stacy Makes Cents Trim Healthy Tuesday Link up. Last year I shared my introduction to fermented foods with learning how to make a homemade drinkable yogurt called Kefir (see my original kefir post here). Since last summer, its become an staple in our house and I have split my grains with many of my readers to make their own kefir. Fermented foods are all the rage now, and for good reason. They are full of probiotics to help improve your overall nutrition, increase healthy intestinal flora and increase immune function to help fight of harmful bacteria and other pathogens. (See more on the benefits of fermented foods here). Since I know many of my readers are kefir makers, today I’d like to share with you a new discovery of mine, kefir cheese! I try to make fresh kefir every few days, but some days I don’t have time to strain it, so I toss it into the fridge to halt the fermentation process. Last week was one of those times. Then it got forgotten… and a little too thick. I left it on the counter with the intention of straining out the grains and tossing the kefir, but when I looked at it, the curds and whey had completely separated. I did a quick google search on how to make kefir cheese and found this great post on Cultured Food Life. I took my clumpy looking kefir, dumped it over a strainer lined with a coffee filter sitting in a bowl and let it sit in the fridge. The next morning, a little afraid of what it might taste like (or if I’d give myself food poisoning), I spread it on my toasted sprouted bread….. It was delicious!!! 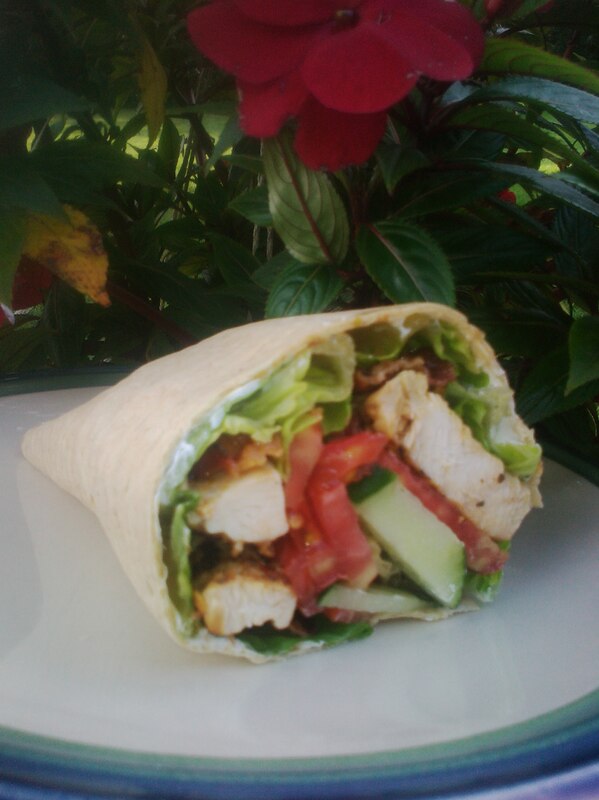 So delicious that I made a second batch and have used it in my sandwiches every day now on my Trim Healthy Mama diet. Its considered an S or FP (thanks to Stacymakescents.com for the clarification!) Its spreadable like cream cheese and has a tart flavor. Its so easy to make too! I’m sharing this post with you today because I have thought in the past that it was just too hard eat healthy, but I want you to know that there are some simple and very healthy things you can do that are very easy!!! Kefir and kefir cheese are both great things to give to your kids. My family loves kefir shakes in the morning and now the cheese on their sandwiches. Its so delicious and the benefits of fermented foods keep you and your family healthy. The picture above is my breakfast today. Toasted Trader Joe’s sprouted whole wheat bread with kefir cheese, cucumbers and seasoned with Gwen’s Nest’s recipe for Greek Spice Blend. I served it with egg beaters and sauteed yellow crook neck squash for a fresh summery meal. 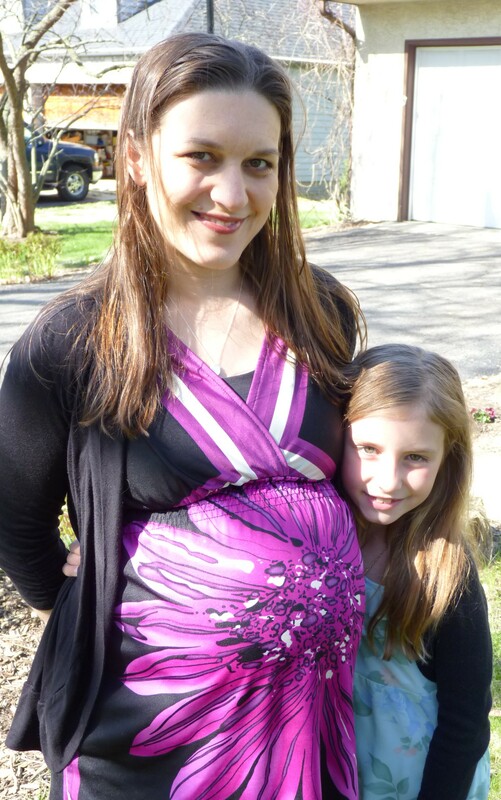 This post is linked to Gwen’s Nest and Stacy Makes Cents as part of Trim Healthy Tuesdays. With summer gardens in full bloom, I’ve been enjoying lots of delicious fresh picked vegetables thanks to my father-in-law’s huge garden. 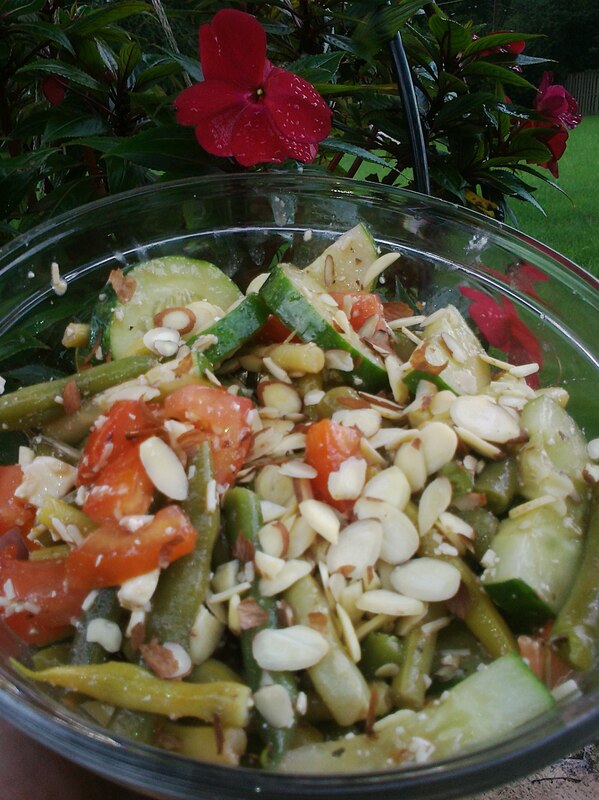 With green beans and cucumbers bountiful this time of year, I made this tasty, yet easy green bean salad I thought you might like to try! It fits on my Trim Healthy Mama diet as an “S” meal. Boil green beans for 8-10 minutes until tender. Remove from heat, strain and put in ice water to stop the cooking process (this will leave you with some nice, crunchy beans). Add cucumbers, tomatoes, shallots and feta. Season with salt and pepper. Drizzle with light balsamic vinaigrette and toss. Chill for at least one hour or overnight. Sprinkle almonds on before serving. Enjoy! Other great additions to this salad can include walnuts & fresh grated parmesan cheese. Looking for a full meal? I added some thinly sliced tuna steak to the top – delicious!! This post is linked to Gwens-nest.com and Stacymakescents.com Trim Healthy Tuesdays Link-up. Just when I thought summer was going to slow down a bit and we were done traveling, we got a wonderful surprise; we were about to go on the biggest trip yet! 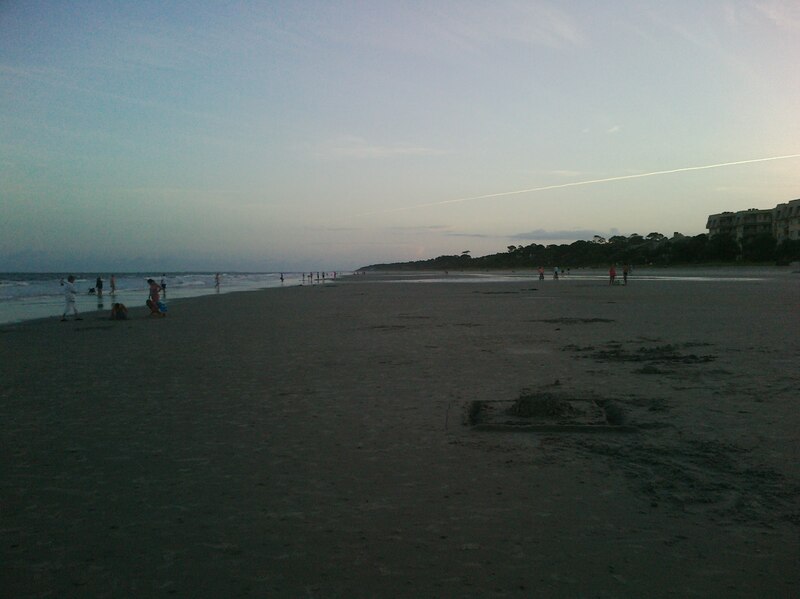 My husband called me on a Thursday morning and told me friends of ours graciously offered us a week in their condo on the ocean in Hilton Head, South Carolina that they were unable to use. The only downside was we had to leave in less than 48 hours! We couldn’t turn this offer down, but as the queen of planning for our household, I was really wondering if I could pull of continuing with our new Trim Healthy Mama lifestyle on such short notice! Once you get accustomed to eating the carb monitoring, no sugar, healthy plan, it gets much easier. However, going out of your elements on a vacation makes things a little more difficult, especially because one of our favorite things about vacation is going out to eat! First, make a plan. Since my husband and I are already at our goal weights, we decided we would stick to the plan strictly during the day, but crossover at night and allow 3 meals of the 24 to be “total cheats”. My goal was to enjoy ourselves, but not get sick by overindulging! Second, pack up as much Trim Healthy Mama food as you can. Since this was a surprise trip, I had just done my weekly grocery shopping. I packed up 2 coolers with Greek yogurt, eggs, egg substitute, stevia, light cheese wedges, lean lunch meat, Joseph’s Pita and Lavash bread, Trader Joe’s sprouted bread, almond milk, natural peanut butter, tuna, tons of veggies and fruits as well as other plan approved foods. This made breakfast, snacks and lunch time easy for me. I loved getting up every morning to enjoy a breakfast like a delicious egg, mushroom and spinach wrap with a cup of hot coffee with heavy whipping cream while sitting on my balcony overlooking the ocean. After a morning at the pool or beach, I’d return to our room for lunch for a tasty lean turkey sandwich with Greek yogurt and sparkling water. Dinnertime was the challenge as we went out every evening, but since we were on the ocean, I decided to try different kinds of fish each night. 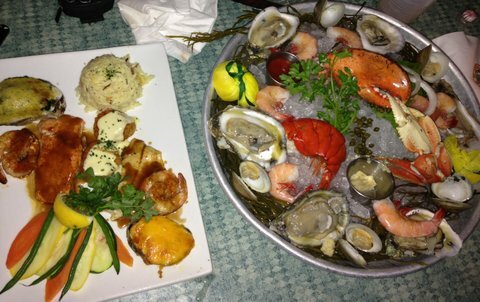 It was glorious to have shrimp, lobster, crab, mahi mahi, tuna, salmon, mussels, oysters and scallops to enjoy! Third, when you cheat, you don’t have to go crazy!! I think in the past when I have dieted, I lived by the philosophy, “Well I’m off the diet, so I might as well enjoy it!” I would totally pig out and feel so bloated and sick. This time, I decided on the nights I would allow myself to enjoy the fine dining, I would keep it small. Just 2 pieces of pizza, a few hushpuppies, or a couple of adult beverages. I thoroughly enjoyed everthing and did not get sick. Finally, don’t forget to exercise. My friend jokingly told me before I left “Exercising on vacation is overrated!” Before this trip, I totally agreed. I never understood the people who spent hours on their vacation in the exercise room or running. I thought vacation meant a break from everything! However, since I have been seriously exercising 5 days a week, I knew taking a break for over a week would make it tough to start back up. Since I had just started this new exercise program called “Pretty Fierce Lean Out” by Lindsay Brin of Moms into Fitness, I tossed the 11 DVD set into my bag with some hand weights and hoped for the best. It was the best decision! After my tasty THM breakfast, I’d pop in my DVD and get an awesome workout. I’d feel more energized for the day and was burning tons of extra calories. I not only enjoyed the trip, but came back with a flatter stomach! Bottom line, with a little planning, you can have a healthy and enjoyable vacation! This post is linked up to Gwen’s Nest and Stacymakescents Trim Healthy Mama Tuesday Link Up.